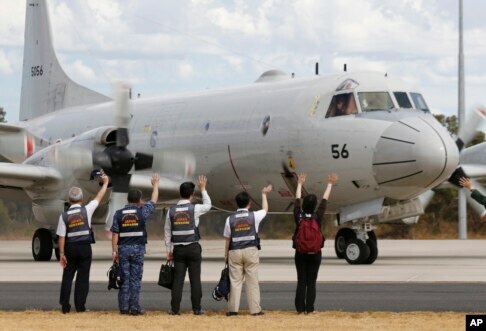 Malaysian prime minister Najib Razak on Monday said a new analysis of satellite data showed the missing Malaysia Airlines plane plunged into the southern Indian Ocean. The news was a major breakthrough in the unprecedented two-week struggle to find out what happened to Flight 370, which disappeared shortly after takeoff from Kuala Lumpur to Beijing with 239 passengers and crew aboard. Malaysian Airlines, meanwhile, sent text messages to members of families of all passengers and crew on board the jet, which went missing on March 8, saying it was presumed crashed and there was no hope of survivors. Malaysia Airlines Flight MH370 vanished from civilian radar screens less than an hour after take-off from Kuala Lumpur for Beijing with 239 people on board on March 8. No confirmed sighting of the plane has been made since. However, several unconfirmed reports of debris came in after the search and rescue operation was scaled up.